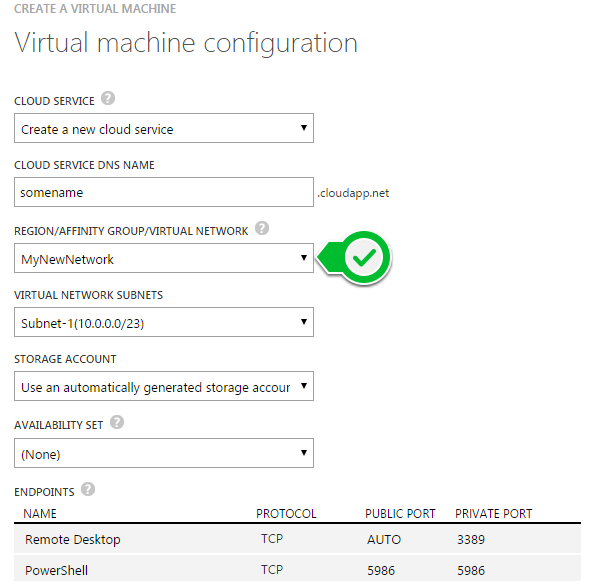 Everybody that has been working with Azure Virtual Machine for some time will tell you to put VM’s in a Virtual Network. I’ve written about moving VM’s or creating VPN. This post is about the time I was smart enough to follow best practice on creation. First create the virtual network. Just use the Quick Create, give it a name and create it. Now that we have a virtual network, let’s create some virtual machines. To create the virtual machine(s) use the wizard as the Quick Create does not offer virtual network selection. On the third tab select the virtual network you’ve created before. Every vm on the same virtual network can find the others by name. Just make sure to punch some holes in the firewall. This entry was posted in Development and tagged azure virtual network, azure vm. Bookmark the permalink.